If you're new to Notejoy and want a quick overview of what it's all about, then this getting started guide is for you. We introduce the core concepts of Notejoy and get you on your way to getting the most out of the product. This should be a fairly quick read for you, with much more information available in our help center as well. If you don't already have a Notejoy account, it's free to sign up. We're so glad you asked! 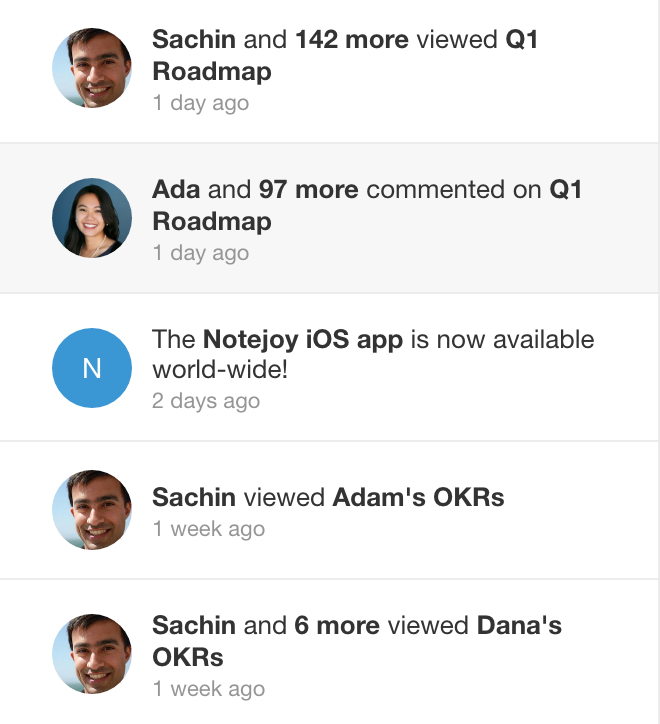 Notejoy is a collaborative notes app for your entire team. It helps you get your most important work out of the noise of email & Slack and into a fast and focused workspace. In a nutshell: Every team library in Notejoy is a space with an admin, and team members who can access and view the notes within it. 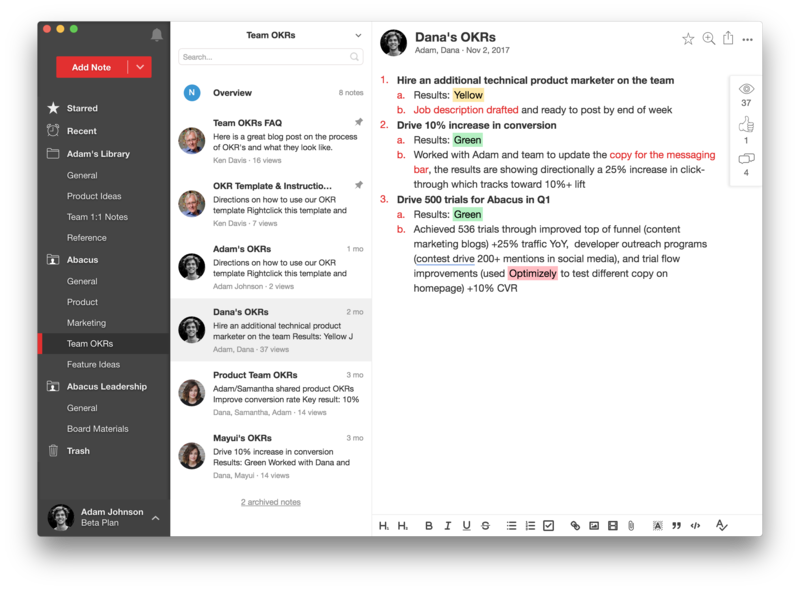 Everyone with access to a team library has the ability to create content, organize and curate content, and collaborate on documents together in real-time. You can organize these libraries any way you want such as by project, function, department -- or even include external team members, such as outside partners or vendors. When you first get started in Notejoy, you start with a personal library which is a private space just for you. You can use this to write down ideas, draft content, or whatever else you dream up. You can easily drag and drop content between libraries as a quick way to share. In addition to this, you can create or be invited to a team library. A team library is a shared space for any size team. They are like Slack channels for documents. Each team library is shared with a specific set of people, such as the entire company, a specific department, or a project team. When you add a new note to a team library, it is automatically shared with the entire team without wasting time on setting permissions. Just create and it’s automatically shared. 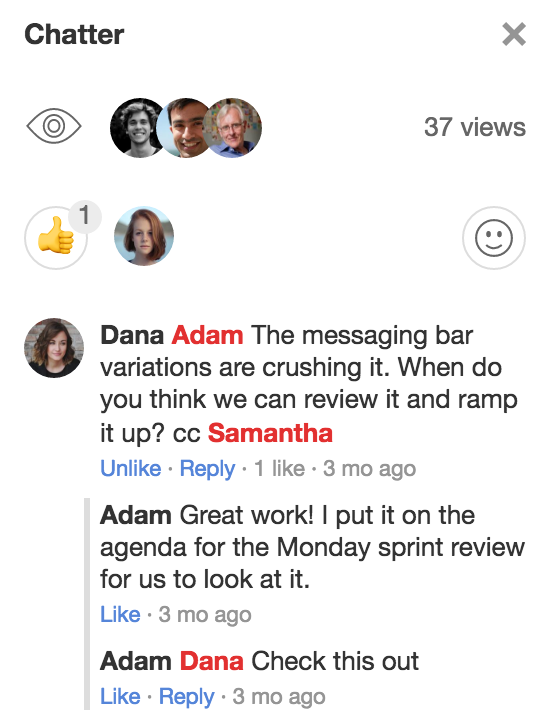 You can create as many team libraries as your team or company needs to organize notes. When you first enter a library, we take you to the library overview, which shows you the most popular notes, recently added/edited notes, and a leaderboard of all the authors who have contributed to the library (based on how popular their notes are). This is a great way to get the gist of a library and to stay caught up. To create a team library, click the down arrow to the right of the red Add Note button. Domain-level sharing - Rather than adding people one by one, you can also share team libraries to your entire domain. For example, if your email domain is user@companyfoo.com, you can share a team library with anyone who signs in to Notejoy with a "@companyfoo.com" email address. External sharing - Notejoy libraries can be shared with anyone inside or outside of your company. So if you need to collaborate with someone who doesn't have the same email address, you can! Just invite them in and they will be able to collaborate. Team libraries contain notebooks, which are like folders that contain notes. You can create as many notebooks as you like within a team library. This is helpful to organize notes within team libraries by project, by sub-team, or organization. To create a notebook, click the down arrow to the right of the red Add Note button. As you fill your notebook, we'll show you a notebook overview once you reach 5 or more notes. The notebook overview provides a great summary of the notebook, including the most popular notes, recently added/edited notes, as well as notes pinned by the curators of the notebook. Within notebooks are notes where you can write things down. In addition to typical styles like headers, bullets, and checklists, notes can also contain all kinds of content, including images, videos, file attachments, and even Google and Office documents. When you attach a Google Sheet, for example, we'll include a link to the sheet so it stays up-to-date. We also make it easy for you to keep your notes organized. To help you get more done, we've designed Notejoy search to be a lightning fast way for you to find the information you need. You'll notice a search box at the top of your Notejoy experience. This searches across all of the notes that you have access to. Simply type a word or phrase into the search box and we'll show you the results with the search words highlighted. Notifications are a quick way to find out what's going on or needs your attention. You'll see notifications at the top left when you're in the app, and we also support notifications in-app, email, mobile, or even through our Slack integration. You can configure which notifications you want to receive and where you see them. To customize your Notifications, access Settings from the menu at the bottom left. While Notejoy is a powerful tool for solo use, it really shines when you're collaborating with others! You can add and invite people to team libraries at any time by right-clicking your team library and selecting share. When you invite someone to a library, they'll receive an email and can sign up from there. If they're already a Notejoy team member, the library will automatically show up in their list of available libraries. We make it easy for you to import your Google Docs into Notejoy as a quick way to get started. At the top left, click the down arrow to the right of the red Add Note button. You'll see an option there to Import Documents. Importing documents will create a new note with the content in the body and the file attached. Some teams find it useful to create templates in Notejoy. You can easily create a template note and having others duplicate and edit the copy from there. Pin the note to the top of your notebook to make it easy to find, and instruct your team members to right-click the note and select Duplicate to make a copy for themselves.